If there is one thing in this city that you cannot ignore during Christmas season, it is stollen. Dresden is very famous for its traditional Christstollen, a very heavy sweet Christmas cake that is sold in every bakery and on every Christmas market. It’s shipped all over the country to friends and relatives and I am pretty sure you can order it from abroad, too. In addition to the traditional stollen, which is made with lots of butter, dried fruits and candied peel, there are many other versions. Nuts and marzipan are popular and bakers are trying out new ingredients every year. This season, for example, cranberry stollen are very popular. 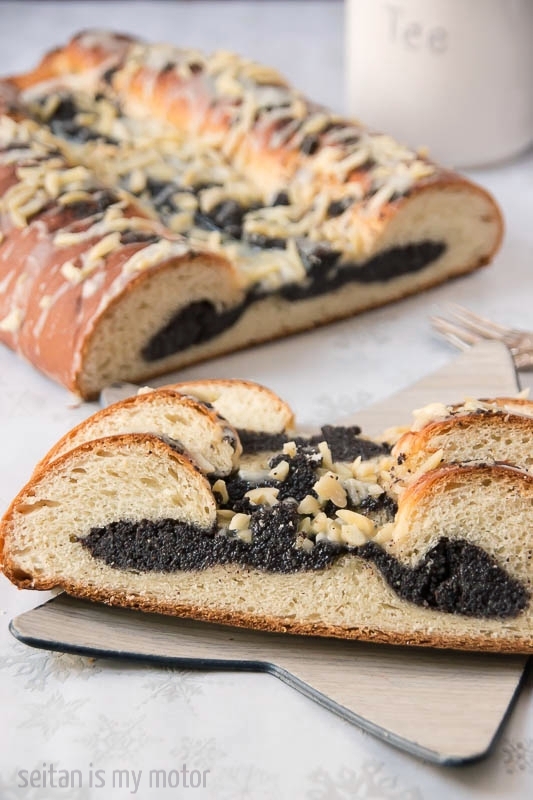 Because I love poppy seeds, my favourite is still poppy seed stollen which is closely related to similar Czech and Polish (Makowiec) baked goods. Stollen is usually baked in advance and stored for weeks before it is finally eaten. Therefore it is made from a heavily enriched yeast dough with a very high fat content. The fats of choice are butter and sometimes lard. The fat and the dried fruits help to keep the cake fresh and moist. Poppy seed or marzipan fillings serve the same purpose. To make the dough: Combine flour, sugar, soy milk, and crumbled yeast in a bowl. Let sit for ten minutes. Add the remaining ingredients. Use a had held or stand mixer to knead the dough until smooth (4-6 minutes). Cover with a damp kitchen towel and let sit in a warm place for 60-90 minutes, until the dough has doubled in size. Meanwhile prepare the filling. If you haven’t already, grind the poppy seeds in a coffee grinder. In a small pot bring the milk to a boil. Stir in poppy seeds, semolina, sugar, and vanilla. Remove from heat, cover with lid and let sit until the mixture has cooled to room temperature. Stir in rum and lime juice. Place on a baking sheet lined with parchment paper, cover with a damp kitchen towel and let sit in a warm place for 45 minutes. Preheat the oven to 180°C (350°F). Bake the striezel for 25-30 minutes. The top of mine started to brown pretty quickly so make sure to look after it. If it browns too fast, cover with a sheet of aluminium foil. Combine powdered sugar and lime juice. Whisk until smooth and sprinkle over the cake. Sprinkle the almonds over the glaze. Let the glaze dry serve. Store at room temperature or in the fridge, wrapped in aluminium. This looks yummy. Thinking of trying it as the recipe seems simple and I love poppy seeds. Thank you for making this! I am glad it still turned out delecious. To answer your question, wholemeal spelt, wholemeal rye, and strong flour are not the best choices when you want a fluffy cake like consistency. Rye and spelt can be tricky to bake with. The gluten those flours contain is much weaker than that of wheat flour. This often makes the baked good dense, rye being the main offender here. Whole flours also make baked goods denser than regular flours. So, like you said, I think the mix of flours was the culprit. Thanks for this beautiful stollen recipe. It looks gorgeous but sounds like it is fairly easy to make. I love poppy seeds too, so I am sold on this one. How wonderful. I am glad you like it so much. To answer your question: Yes that should work but I would probably half the yeast in that case. Beautiful and magical as always! I have a ton of poppy seeds I must use up before they expire (I’m on this new kick of using food before the expiry), so this looks like my #1 choice! My family never has stollen (or stollen-like treats) at Christmas. I think I’m going to change that! Every time you post something with poppy seeds in it, I end up making another note to buy bulk poppy seeds & get to baking. This cake sounds terrific. Happy Holidays, Mihl! Gruss aus Nova Scotia, Canada. Poppy seeds remain a vivid German Christmas childhood memory for me. This recipe looks great. So nice to find vegan versions of baked goods that I used to love. Thank you for posting, and Frohe Weihnachten to you and your readers. Stephen L. in Halifax. Frohe Weihnachten to you, too! My mother used to love mohn cake so much! I just tried last night. Turns out perfectly delicious. It is not that heavy compared to the other stollen-ish breads/cakes I had. 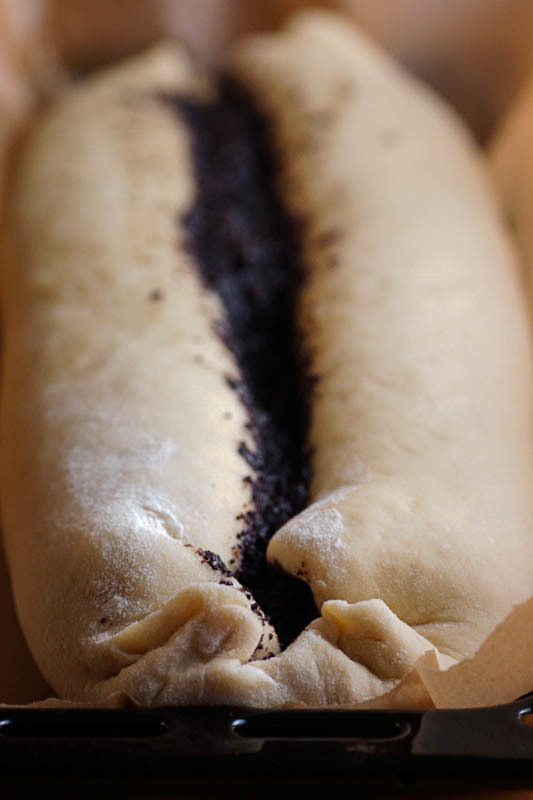 The poppy seed filling is wonderful, not super sweet, with a nice texture! Thai is great! Thanks, Elaine. boah, mihl – der striezel sieht zum anbeißen aus! This is so pretty! I’ve never used poppy seeds in baking before but the idea really appeals. The bread itself looks like it has the perfect texture too. I felt compelled to comment – that is simply beautiful! The filling sounds incredible. That is gorgeous!! I wish someone would use your recipe to make that for me as a holiday gift! :-) Or I could just bake it myself, I guess. But it’d be more fun for me if someone did the work. If I lived closer, I would leave one at your door! This looks *amazing* and hits all my poppy seed spots at the moment :D I’ve tried looking up Semolina and what it does, since it hasn’t caught my eye in any of the shops near me – it’s some sort of flour? If I can’t find it, can I replace with with more flour, or does it serve a specific function in this delicious cake? It is a course wheat meal, similar in texture to polenta. It’s used for thickening and to give structure. I think polenta (corn meal) would be a better substitute than flour. Or breadcrumbs. Love that you chose oil over margarine for this Stollen ! It looks fantastic, I’ll try to follow your recipe for Xmas. Are poppy seeds Stollen typical from Dresden ? 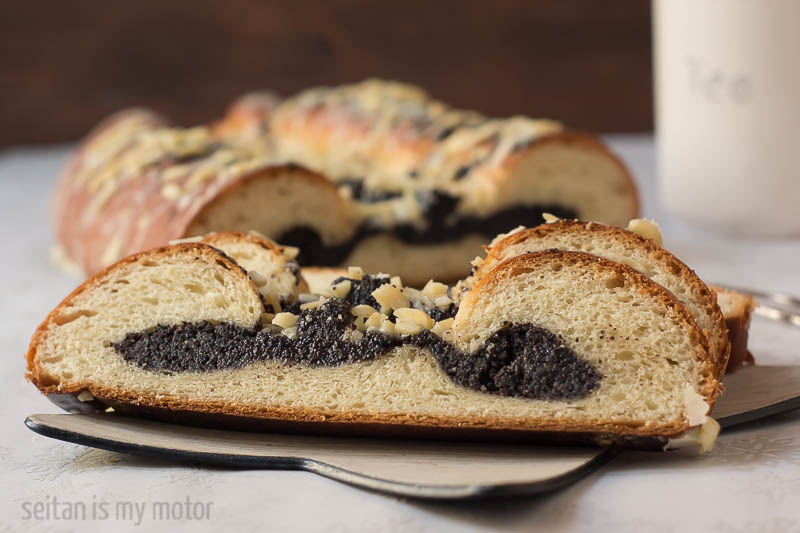 I have seen many Stollen here in South Germany, but never with poppy seeds ! Oh toll, eine super Anregung für Weihnachten. Mein Mann liebt Mohnstollen! Danke dafür!